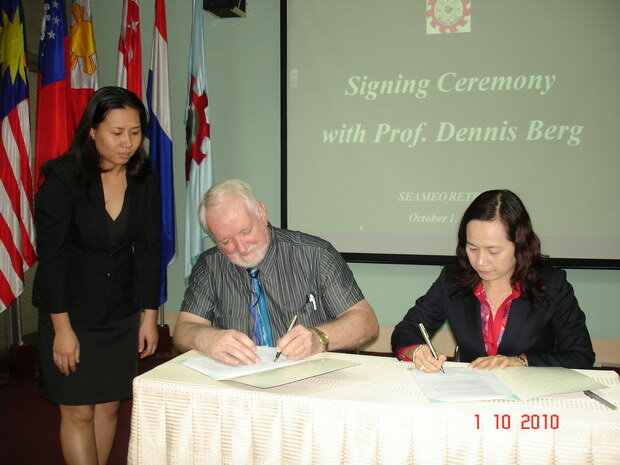 SEAMEO RETRAC welcomed a new member, Dr. Dennis F. Berg, Emeritus Professor from California State University – Fullerton (CSUF), USA, to its family. Prior to his appointment, Dr. Berg served as the Chair of Department of Sociology, Associate Dean of College of Social Sciences and Humanities, Associate Vice President of Academic and International Programs and Dean of Graduate Studies; he has been a professor at CSU, Fullerton for more than 40 years. Working at RETRAC, Dr. Dennis F. Berg assumes the position of Head of Research and Development starting October 1, 2010. He will lead activities in all areas of research including linkage expansion, research skills development, and proposal writing for funding. 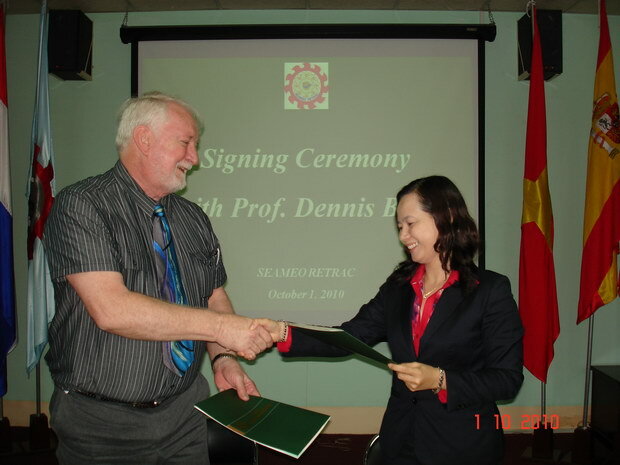 He will also be involved in expanding SEAMEO RETRAC’s workshop/seminar capability as well as be a part of our effort to become an educational accreditation agency within Vietnam. Dr. Berg has been working with RETRAC for a number of years as an adjunct professor/facilitator and trainer. It is hoped that with his experience and expertise, SEAMEO RETRAC will achieve significant progress in expanding its operations both in educational research and in educational management and leadership training. Recently, Dr. Berg has been awarded the Vietnam’s National Medal for Educational Achievements by the Ministry of Education and Training in Vietnam for his contribution to Vietnam’s education.